The Amnesty International report accusing the Syrian government of carrying out mass executions at a prison near Damascus is part of an information campaign targeted against President Bashar al-Assad and aimed at undermining his diplomatic efforts, journalist and expert on the Middle East Karin Leukefeld told Sputnik Germany. The research, unveiled in early February, "has been exploited for certain political purposes," she said. "One cannot rely on the credibility of this report – as opposed to the work Amnesty International did in the past." The report should be viewed in the context of an information campaign targeted against the Syrian government and Russia, Leukefeld added. The journalist is convinced that this campaign was designed to force President Bashar al-Assad and his government to stand trial at the International Criminal Court (ICC) by influencing public opinion and the media. In Leukefeld's opinion, such campaigns have undermined, if not torpedoed Damascus's efforts aimed at bringing peace to Syria. She specifically mentioned the work on the new constitution as a case in point. "These are important political processes. It is in the interest of the Syrian people to support them," the journalist said. On February 7, Amnesty International issued a report accusing the Syrian authorities of killing 13,000 people at the Saydnaya prison. Damascus has denied the claims, with President Assad saying that the document was not true and based on allegations. Critics have pointed out that the report appeared to lack sound evidence and "deep expert analysis," as Russian Foreign Ministry Spokeswoman Maria Zakharova put it. Leukefeld also maintained that while the war is still raging, Assad is likely to remain in power. "If there was a political process, it could convince people to support different politicians. However, the war is still ongoing. There are no political debates and reforms. This is why at the moment I don't see any alternative," she said. Leukefeld urged Germany and the European Union to engage in dialogue with the Syrian government. 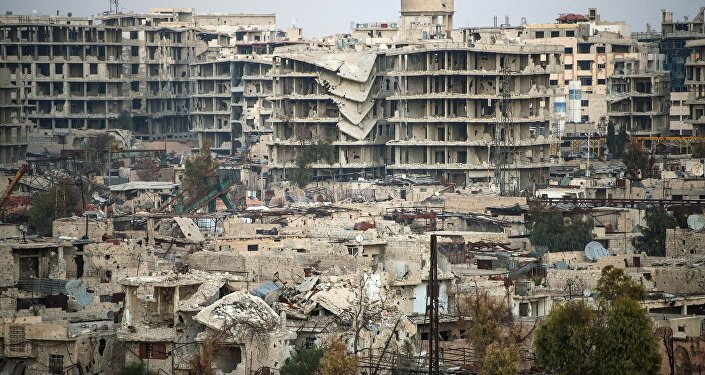 The journalist also praised Russia, Turkey and Iran for their efforts aimed at resolving the conflict which is estimated to have claimed more than 400,000 lives, leaving half of Syria's population displaced and sparking a refugee crisis. In late 2016, Damascus and key armed opposition groups reached several agreements, including a ceasefire deal, with Moscow, Ankara and Tehran sponsoring the talks. In addition, Russia, Turkey and Iran have kick started the Astana peace process, with two round of talks held this year. The negotiations marked the first time that a delegation from Damascus and representatives of the armed opposition have met since the foreign-sponsored insurgency morphed into a large-scale civil war in 2011.